True luxury style is something you can be proud of. It's the ability to wear something beautiful and timeless in an exquisitely personal way, without having to turn the other way or ignore the impact of your purchase on the environment, the people who made it, or the business practices and supply chain of the company that produced it. Buy only what you truly treasure. Insist on quality that allows you to enjoy each piece for as long as it inspires you. The carbon footprint of an item's production is worn away by each decade you wear and enjoy it. We believe that if what we create is not truly beautiful, inspiring and worth keeping, there's no point in making it. We also believe that our quality standards should be so exacting that a simple bow tie can become an heirloom - yours to wear, enjoy, and some day share with someone who is inspired by you. There are so many ways you can reduce waste in a modern supply chain, and so many ways you can reduce your impact on the environment as a manufacturer. This applies to small artisan studio producers, like ourselves, as well as our partner production mills in Ireland and Britain, and our small and large scale competitors both here and all over the world. Yet, with fast fashion leading the entire industry from the bottom, there's a rush to get the latest designs out that results in wasteful production processes, unsold stock cut up and dumped in landfills, and processes that are harmful both to the environment and the factory workers operating under pressure to produce them, often in situations that compromise their health and safety. We believe it's possible to have a zero waste production process without compromising quality. Innovation like this takes time, but we truly believe it's worth it. We've worked with both our mills and our artisan piece-workers to develop methodologies that allow each of our product lines to be developed without any compromise and without any waste and we constantly look to see if we can improve not only the quality of our scarves and ties, but also whether we can use fewer chemicals, and totally eliminate waste. Industrially, embroidery is done using a standard frame 6"x6" size no matter what the size of the logo or monogram. There's a front and a back, which is fine for most things, but not for our scarves and shawls, as we believe that the back must be so good that if you prefer it, you can make it the front. We knew we could find a way to make embroidery less wasteful and more beautiful, and to 'balance it' so that there's no impact on the drape of the scarf, so we brought our embroidery in-house, on our own machinery, until we perfected it. All of our cut-and-sew product lines have flexible production pipelines that allow other pieces with imperfections to be re-used as a semi-processed material input. This allows us to never have 'seconds'. So, if it has our name on it, it only contains the natural flaws that enhance it, which we call 'the patina factor'. Brendan Joseph cuts loom-state silk and linen shawls from his 'Edge of the World' collection. Printing and Dyeing is the fashion industry's dirtiest secret. It can be shockingly harmful to the environment and to factory workers, and it can be extremely wasteful. As standard, significantly more dye is used in a dye-bath than is required to achieve the desired shade, which is why a piece can 'bleed' and yet not fade. Small producers often use compound 'brute force' machine wash dyes that CANNOT even apply entirely to the pieces they're dyeing. Silk, cashmere and wool can be dyed using compounds that will not change the colour of linen, cotton or other plant-based fibres, and vice-versa. A cool illustration of this is cross-dyeing, where you put something made from cotton and wool into a dye bath with two different colours. From purple water, you can end up with a piece of cloth that is clearly striped blue and red. As weavers, we can yarn-dye our fabric. This means that we dye the individual yarns (before we weave), rather than dyeing the woven cloth. This dramatically reduces the dye required and reduces waste. When we developed our linen and silk pieces, such as 'Horizonless' and 'Silver Shore', we decided to work with natural un-dyed linen to further reduce the chemicals required. 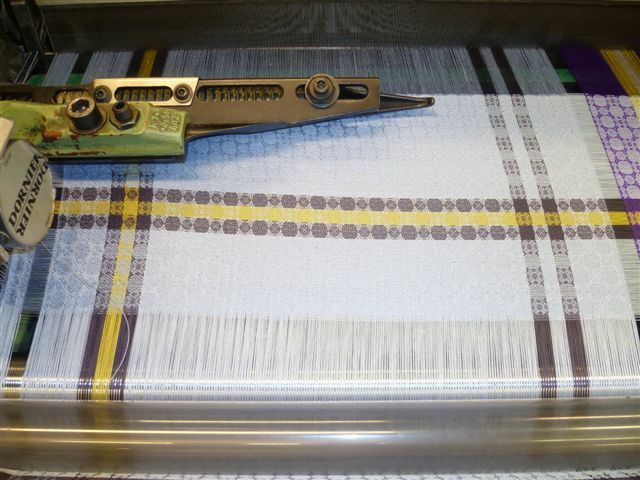 On the loom: Blue silk woven scarf, 'Sandymount Strand' by Irish designer Brendan Joseph. We believe in operating with a respect for the environment, our partners, producers and team members. We only use yarn that has been dyed by our supplier in small batches in the U.K. (West Yorkshire to be precise) to the highest European standards. We only weave in Ireland and the British Isles and we aim to know each person involved in our supply chain personally, with regular visits to listen to them and hear any thoughts they have that will allow us to make their job easier, (such as weaving our shawls slightly differently so that the person performing the initial inspection can carry them in smaller batches), or improve the quality or beauty of the work (such as ways to improve the handle of the cloth or the performance of a finishing technique). While we work only with three natural fibres - silk, cashmere & linen - in a low-impact production environment and with a carefully vetted supply chain, the most important thing is truly that the pieces we create inspire you from the moment you discover them online, and unwrap them in person, as well as hold up with their quality for as long as you continue to enjoy them. We have long been inspired by a company called Everlane that launched just before us, and have incorporated their call to radical transparency into everything we do. Until now, we've answered every question we get asked about our production and supply chain, but because we were seeking to work through the existing retail infrastructure, we were careful to be sensitive in how we put our values out there. The reality is that most of our competitors don't share these values, regardless of what they say. Their production does not stack up, and we didn't want to get into any controversy, but now we think it's worth it, because if we don't show what we are doing, and talk about why it matters, and actually that it is possible if you truly seek to innovate, then how can we possibly change this industry? We have never produced seasonal fashion collections, and we've always aimed in our own small way to use this to make a difference when we talk to retailers and customers about why we are not a fashion label, and the benefits of slow fashion, as pioneered and later abandoned by so many. We will start to talk more about this and celebrate companies that stay true to their values, such as Alabama Chanin, People Tree and Ten Thousand Villages. We'll also be willing to talk about the problem of 'greenwashing' publicly. While different to most, we still operate within the fashion industry, and we are acutely aware of the challenges our competitors have and the reasons they don't adopt our standards. We are going to start talking about some of these challenges, including the fact that the retail store only pays the supplier $35 for every $100 they sell, and that supplier is often the wholesaler, who has a $5 margin, meaning the brand or company only receives $30 which has to cover materials, production, shipping, as well as their overheads and marketing. This is a model that is not sustainable, as PROVEN by the nauseating and constant discounting within the industry. I receive at least three emails a day offering 70% off something, which means the retailer has ended up selling the item break-even or at a loss. But what if they bought less, what if they took less, what if there was a genuine partnership directly between producers/brands and stores that allowed for the prices to be set fairly and volumes forecast so there never had to be discounting and NEVER shredded perfectly good clothes and shoes to be dumped in landfills. We're also aware of the ethical landmine in-and-of-itself that is the ethical certification industry, which seems to be largely free of oversight, and has been shown to hide rather than prevent some atrocities and abuses, and is in and of itself a $7.8bn industry. We've seen that we can get our supply chain certified child labour free, but gosh, if there are retailers that have child labour in their supply chain, we need to start campaigning for the laws to be changed in the US and Europe to PROSECUTE them. With online retailing, the market for luxury goods has increased by $43bn per quarter, but with quality continuing to limit lifecycle, and brands anxious to never see their goods sold second hand, there's a pointless snobbiness against passing on items that won't be worn again. What if Chanel or the LVMH stable sold new and certified used Chanel / LV side-by-side in their store? Like Mercedes-Benz do with cars. There's NO reason not to do this, and we need to see brands take a position of ethical leadership, and if it starts with luxury, then attitudes WILL change rapidly. It will also combat the market for 'fakes', by providing access to the real thing. (Whilst sometimes fakes are good quality, they are a scourge on creativity, and sadly MUST result in the destruction of the goods). I believe this will filter down into the volume market and that people will buy less, but buy better. The ethical reality is that there's an affordability question about the cost of ethical production, and many simply cannot afford to buy these items new, but if we can change the entire mindset of the consumer, then we can facilitate fairer pricing and a new industry that SERVES. The key fact remains that for the same money, the majority of consumers prefer a cheaply made 'new' item to a gorgeous timeless second hand one of significantly higher quality. This must change, and as leaders within the luxury market, we must initiate the change. Either the original owner needs to love the item so much they keep it forever, or brands need to facilitate access to those who love the products but financially, their dream is of one that's been well cared for. The time has come to be radically transparent. 'Horizonless' blue silk and linen shawl, by Brendan Joseph. We want to inspire our competitors to serve you better, and to work harder to protect their workers (both employees and supply chain partners), the environment (in both producing LESS junk and doing less harm as they do it), and the communities in which they operate (by running businesses that behave ethically). Our exquisite luxury handmade silk scarves, shawls, neckties, bow ties and pocket squares are made in Ireland and the British Isles, designed by Irish artist Brendan Joseph. If you'd like to to talk to us about how we create our collections, or to collaborate, or commission a bespoke gift, just get in touch. You can also fill out this form for press and business inquiries.